If you are like me….you hate to waste money. Unfortunately, I can't begin to estimate how much money I have wasted over the years by throwing away food…mostly produce!!! I have worked hard to reduce produce waste at our home and wanted to share how I am doing it! I have been buying a lot more produce over the past couple of years in an attempt to eat healthier. More produce can easily mean more waste…but not if you are careful and follow these guidelines to reduce produce waste. This seems like an obvious tip, but in actuality a lot of people buy things that they know probably won't get eaten. Sometimes I see produce on sale and it is a great deal and I buy it…knowing in the back of my mind that we will be really busy that week and won't be home much and it probably won't be eaten. My tip is to be conscious when you are shopping and only buy produce that you are fairly certain will get eaten! If you have a meal plan and know what produce you will be using in your cooking it will help you when you go to the store. You will be buying produce items that you know you need for that week. This will save you trips to the store and save you from throwing unused produce in the trash can! When you get home from grocery shopping you need to take a little time and do some prep work on some of your produce items. If I stop and wash the grapes and put them in a large Ziploc back…they get eaten a lot quicker then if my kids have to take them off the stems themselves and wash them as they want to eat them. If I cut up the cantaloupe and have it in a clear bowl in the fridge it will get eaten! If it that whole cantaloupe sits in the produce drawer….it will probably go bad before it gets eaten! One any given day you can open my refrigerator and find at least a couple of plastic containers with leftover green beans, peas, corn, etc. These used to go bad after sitting there for a week or two and I would just toss them. When I changed my mindset to reduce produce waste I came up with a plan to use these veggies up! I try to make a meal each week that makes it easy to use these leftover veggies. 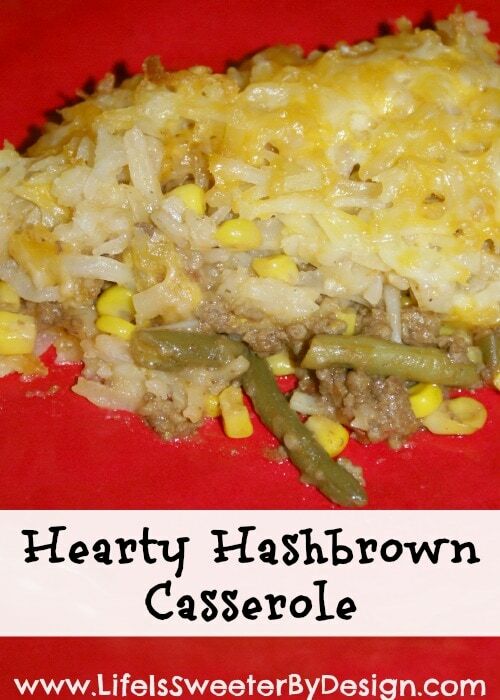 I will make a pot of vegetable soup or even a casserole like Hearty Hashbrown Casserole. These meals are very flexible and you can add a few more veggies to the mixture and still come out with a great dish! When you see that your fruit is getting close to spoiling you can save it from certain death! 🙂 Cut the fruit up and put into small freezer bags and freeze it to use for smoothies! My family loves to drink smoothies and they add so many great nutrients to your diet….making up smoothie freezer bags can also help you reduce produce waste! The great thing about smoothies is that you can add all sorts of fruits and even veggies and it will taste great! Don't be afraid to try new produce in your smoothies! One dinner you will find on our weekly meal plan is what we call the Big Salad (if you are a Seinfeld lover like I am…you will understand the reference, lol). This is basically just a big garden salad that we top with popcorn chicken or popcorn shrimp so that it is a full meal. This is a great way to use up produce that is close to spoiling. When I see a bag of lettuce or spinach leaves that won't be good soon…I know it is Big Salad night! I can use up cucumbers, carrots, mushrooms and so much more! Plus it is a great way to get more veggies in to your diet! 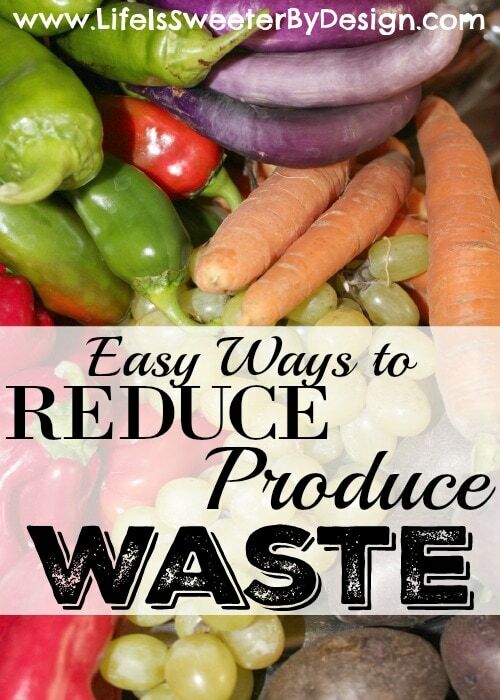 I hope these tips have given you some ideas to reduce produce waste at your house. These tips will save you money and keep you from feeling guilty about throwing money out the window when you throw food away! What are your favorite tips to reduce produce waste? If you want to find out some other kitchen tips….check out my guest post, How I Save Time and Money in the Kitchen and You Can Too over at My Stay at Home Adventures!